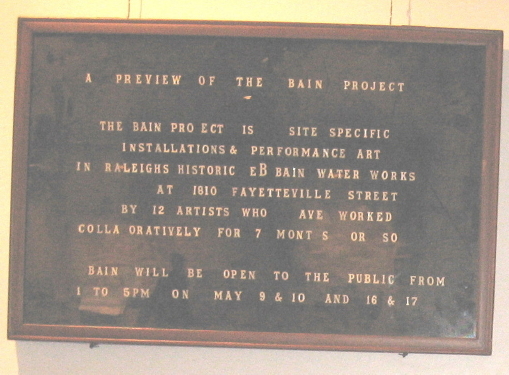 The preview show for The Bain Water Project, which opened at The Morning Times on First Friday, offered some glimpses of what we can hope to see at the full on-site installation in May. The show also displayed a documentary, self-reflective style which is permeating the group’s work overall, I think in an excellent way. 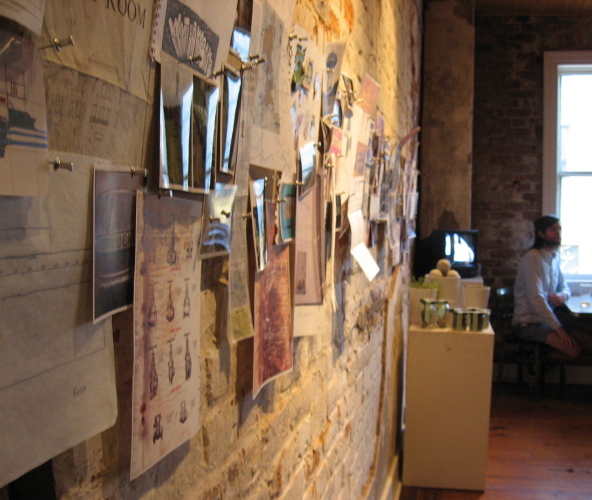 From the large scale photo and video displays seen at the music event, to the “open access” range of information available on some of the artist’s websites, this massive accretion of work is not least interesting for the shape of the artistic process itself, made visible in the large display of notes, drafts, and source materials on display upstairs on Hargett Street. The artists meet most Saturday mornings at the Bain site to collaborate and consult, then spend many more hours creating art work in response to their experiences. 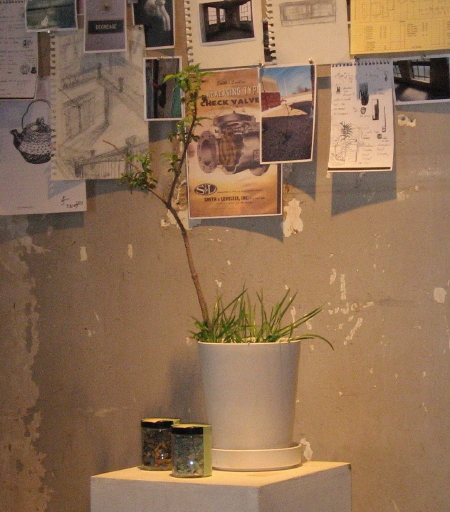 For the preview show, they attempted to evoke a sense of the place, including bringing plants from on site, jars with samples of the debris and filter material, as seen above. 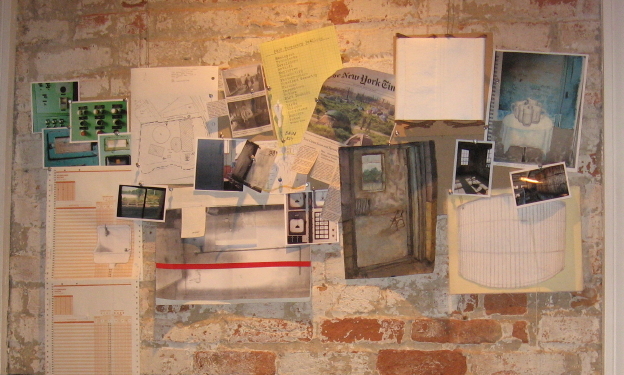 The stripped masonry and ancient brick walls of the upper Morning Times are an ideal setting for the work. The range of media and subjects derived from the Bain site remains quite varied, and if I imagine a conventional show of all the finished artworks I have seen, the unifying thread might be hard to describe. Luke Buchanan Miller’s large traditional paintings have a wonderfully loose sense of perspective and give a successful Impressionist view of an industrial space. But it can be difficult to shift gears and then find a totally different response in the layered, heavily sealed and almost subliminal images in the tiles by Marty Baird right next to these paintings. And this show will need to find room for conceptual art, correspondence art, digital graphics, perhaps some kinetic art, and no doubt some performance art before those weekends in May are over. The preview show gives some very encouraging signs that the individual art is also being couched in a group effort to re-present, artistically, the Bain space itself, and to evoke the artistic experiences being undergone by the group. I’m not complaining about the wide diversity of media emerging in the Bain Project. I think it’s all great. Seeing the imagery from so many artistic perspectives is intrinsically interesting. 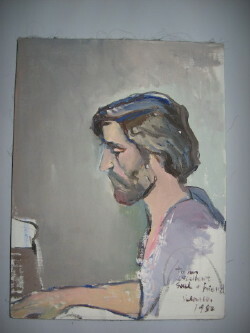 I’m also fascinated to see the project finding ways to exist outside of and between the individual artworks. One favorite part of this show is where you can see a photo, charcoal sketch, and painting of the same scene. You really get a feel for the artistic experience. The catalog pages, technical sheets, and other tatters of beauracracy offer a sense of the human history and the technical complexities of the place. The Bain Water Treatment Plant represents a massive subject. The Art Deco exterior and lobby, the huge myriad of pipes, valves, pumps and holding tanks, and the stark abandoned and long neglected human workspaces, all comprise a complex portrait of early twentieth century Raleigh. As this group of artists pulsates in rythym, collaborating and privately creating, I look forward to an amazing show in May. And I hope the documentary style of the preview show, which illuminates the process-as-product, is a big part of the final event. 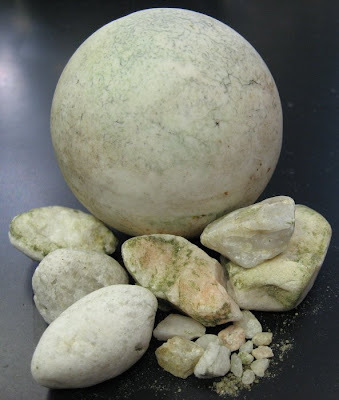 One of the most exciting prospects of the coming year for me is following and responding to The Bain Water Project. The E.B. 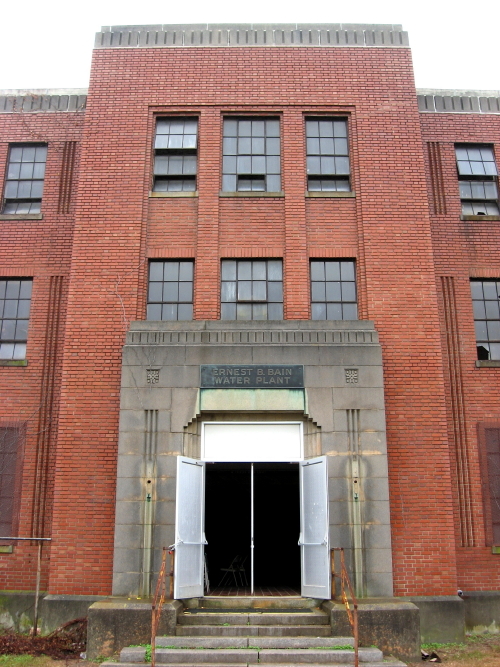 Bain Water Treatment plant is a designated Raleigh Historic Landmark, though it has been neglected for many years. Now a new art project is developing dialogues about the structure and its place in Raleigh’s culture as a new development of the property is planned. While strictly utilitarian in concept, the Bain plant, as built, is perhaps the foremost Art Deco style building in Raleigh. The Bain facility is in a terrible state of debris-filled shambles in the areas used for storage in the 1990’s. But the industrial plant itself is like a museum. I had a chance to visit the site when I presented to the project artists about Walnut Creek and the watersheds associated with the plant and Raleigh water history. The artists are a wonderful mix of highly qualified individuals who work across a wide spectrum of media. At the Boylan Artswalk, they displayed some wonderful preliminary work, including prints, paintings, and photographs. It will be fun to follow this project and I have designated a permanent page about it on Raleigh Rambles. Check back for more!